As a Nation, we pause to mourn the passing of George Herbert Walker Bush, the forty-first President of the United States, on November 30, 2018. His storied life was filled with accomplishment. When he volunteered for duty in the Second World War, George Bush was the youngest aviator in the U.S. Navy. He flew 58 combat missions while defending our country’s freedom. After returning home and completing his education, raising a family, and starting a business, his life of public service resumed. First, as a member of Congress, then as Ambassador to the United Nations, Chief of the United States Liaison Office in China, Director of Central Intelligence, Vice President, and, finally, as President of the United States. 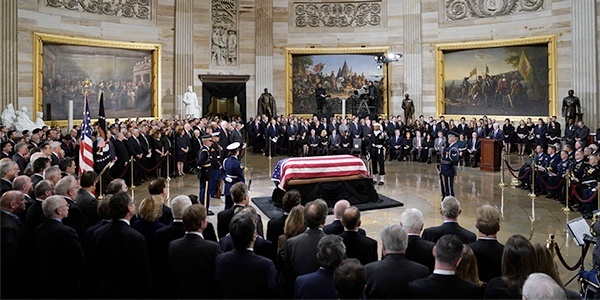 George Bush brought to the White House a devotion to American values and a steadfast determination to guide the United States toward becoming “a kinder, gentler nation.” In his Inaugural Address, he pledged to use American strength as “a force for good.” He was true to his word. With his steady leadership, George Bush guided our country through the successful and peaceful end of the Cold War and into the period of prosperity that followed. In honor of his life of dedication, Wednesday, December 5, 2018, has been declared a National Day of Mourning throughout the United States. On that day, Carrington offices in the U.S. will be closed for a paid holiday, that we might ponder the remarkable legacy and pay our respects to the memory of President George H.W. Bush. We invite Carrington Associates to join the many millions of people around the world who share our grief in this solemn observance. An Equal Housing Opportunity Lender. Copyright © 2007 - Carrington Mortgage Services, LLC headquartered at 1600 South Douglass Road, Suites 110 & 200-A, Anaheim, CA 92806 Toll Free # (800) 561-4567. All Rights Reserved. Restrictions may apply. All loans are subject to credit, underwriting and property approval guidelines.